Life in the Financial Markets—How They Really Work And Why They Matter To You offers the financial services professional, and anyone interested in knowing more about the profession, an entertaining and comprehensive analysis of the financial markets and the financial services industry. 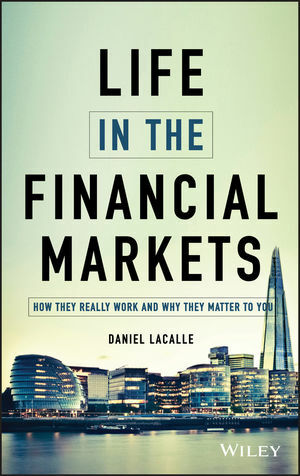 Written by Daniel Lacalle—a noted portfolio manager with EcoFin and well-known media personality—the book goes beyond a simple summary and offers solid advice on the future of the global financial markets. This great resource also includes a review of effective strategies and forecasts the trends that represent potential opportunities for investors. The book reviews the recent history of the financial crisis and includes information on hot topics such as derivatives and high frequency trading. An in-depth section on investment banking is written from the perspective of a successful practitioner and provides clarity on several complex and overly politicized elements of the banking system. The author gives an expert's perspective on the debt markets, monetary policies, and quantitative easing, and helps explain the various issues surrounding sovereign debt, the Euro crisis, and austerity versus growth policies. Comprehensive in scope, this resource also offers an analysis of investment styles, from hedge funds to "long only" investments, as well as an in-depth look at corporate communication and its impact on markets and investments. DANIEL LACALLE is an economist, fund manager and certified financial analyst overseeing equities, bonds and commodities. He holds a postgraduate degree in IESE and a master's degree in economy investigation. Mr Lacalle was voted Top 3 Generalist and Number 1 Pan-European Buyside Individual in Oil & Gas in Thomson Reuters' Extel Survey in 2011, the leading survey among companies and financial institutions.Author of two best-selling books Nosotros los Mercados and Viaje a la Libertad Económica, now in its fifth and third edition respectively, as well as The Energy World Is Flat (Wiley, 2015, with Diego Parrilla).